With rain-swollen Lake Poway close to its spillover point, the reservoir, surrounding trails and Blue Sky Ecological Preserve remained closed Wednesday for a second day. Monday’s rainfall pushed the lake’s water level almost to a 100-foot wide concrete spillway designed to divert excess water into the canyon below. City staffers monitored the lake throughout Tuesday and worried that it could pour over the spillway overnight or Wednesday. However, the inflow rate of water into the reservoir slowed and no spillover had occurred as of late morning, the city’s Rene Carmichael told City News Service. “We are hopeful that the rate of water flowing in decreases and we’re able to avoid the water level rising to the spillway,” Carmichael said. If the lake does spill over, water would flow into a canyon north of the Lake Poway Dam, through parts of the Blue Sky Ecological Reserve, under Old Coach Road, along Thomson Creek adjacent to Maderas Golf Course and ultimately into Lake Hodges, according to the city. The last time water flowed over the spillway was in 1997, and there were no injuries and no property damage. Access to Lake Poway was cut off at Lake Poway Road, and nearby hiking trails and the Blue Sky Ecological Preserve were closed. They will remain closed until city crews can assess the storm damage and make necessary repairs. 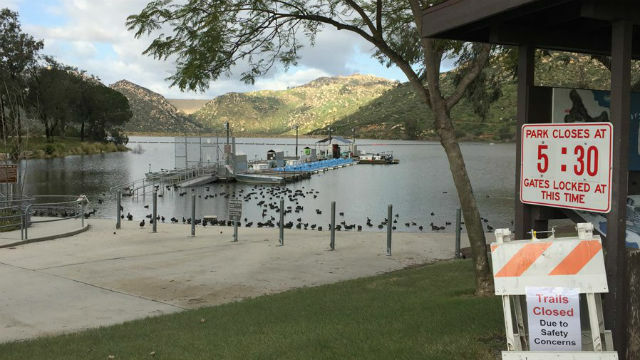 The dam at Lake Poway remains structurally sound, according to city officials.